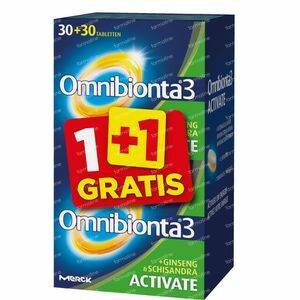 Omnibionta 3 Activate 1+1 FOR FREE 30+30 tablets order online. A busy life, a stressful environment, period of overload, temporary fatigue or an unbalanced diet can deplete our energy reserves and our resistance. Fatigue can then occur already from the beginning of the day! In order to be able to meet the specific needs of this difficult period the active ingredients of Omnibionta®3 ACTIVATE contribute to the energetic metabolism of your body thanks to the vitamins B1, B2, B3, B5, B6, B8, B12, C, and the minerals such as iron, iodine, and manganese. The vitamins B2, B3, B5, B6, folic acid, but also iron help in case of temporary fatigue. Ginseng supports our resistance, fights fatigue and strengthens your vitality. Schisandra is a tonic that contributes to optimum physical and mental resilience. So that each day can begin with full vitality! Omnibionta®3 ACTIVATE is a unique combination of CoQ10 and extracts of ginseng and Schisandra, three lactic ferments (Lactobacillus gasseri PA 16/8, Bifidobacterium bifidum MF 20/5 and Bifidobacterium longum SP 07/3) as well as 12 vitamins and 7 minerals. A nutritional supplement that helps to activate your energy in case of stress or overload. - Take 1 tablet per day with a glass of water, in the morning or afternoon during the meal. - We encourage you to take Omnibionta®3 ACTIVATE for 30 to 90 days and this can be repeated if necessary.